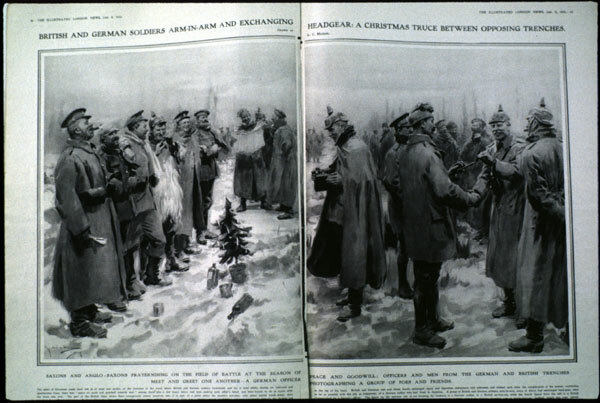 Christmas truce drawing from the London News of January 9, 1915. The drawing's caption reads, in part, "British and German soldiers arm-in-arm and exchanging headgear: a Christmas truce between opposing trenches. Drawn by A. C. Michael." On December 24, 1914, the German and British soldiers laid down their arms, crossed into the "No Man's Land" separating their trenches. They sang Christmas carols, played games, and shared jokes and beer with one another. They also used the time to bury their dead. Can you imagine Hitler's German troops and Churchill's English troops singing Christmas carols and playing games at the beginning of World War II? That would have been impossible. World War I was very politically divisive for both America and Germany. America actually remained neutral between England and Germany for several years, and only entered the war in 1917, to much political dissent. To this day, many historians still consider America's entry in WW I to have been unwise. In a 2004 survey of historians' views on the "greatest" and "least great" presidents, the two presidents voted the "most controversial" were Bill Clinton and Woodrow Wilson. Wilson was considered controversial because he was the President who entered America into World War I, despite enormous political opposition. I have personally interviewed older men who are still absolutely furious at Wilson for getting America into that war. World War I was just as politically divisive for Germany. Germany did not start WW I, as many people na�vely believe. WW I started in the Balkans and spread to Russia. Germany was "accidentally" forced into the war because of a long-standing treaty with Austria which obligated Germany to invade France because France was an ally of Russia. England was pulled into the war because of a previous agreement with France. By 1918, the German people were sick of the war, and when the Americans joined the war, that was the last straw for the German people, who forced their country's leaders to capitulate. Germany's incredible capitulation, long before it was necessary, occurred because the German people were so politically angered by the war. Essentially, Germany capitulated in WW I for exactly the same reason that America capitulated in the Vietnam War -- because of enormous political opposition back home during a "generational Awakening" era. 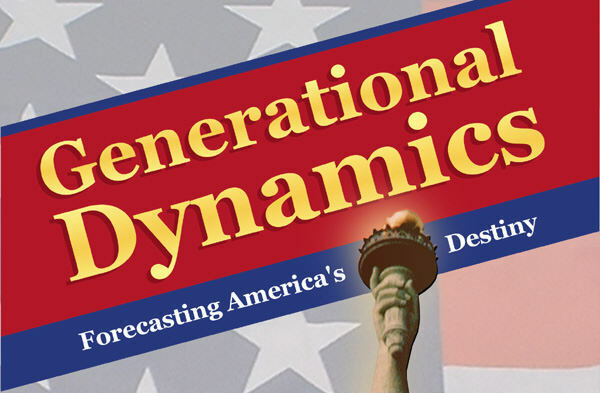 By contrast, WW II was a generational crisis war for Germany (as well as England and America). That war was no "accident." Hitler planned his attack on France and England for years in advance, in secret, and Hitler kept on fighting long after it was clear that Germany would lose. There was no early capitulation. As I described in 2008 in "The gathering storm in the Caucasus," today's international situation is much more similar to the prelude to WW I than to WW II. World War II could almost have been anticipated by someone watching the murderous Adolf Hitler - and actually it was by Winston Churchill. But there was no figure like Hitler in WW I, which was triggered almost by a random event. When Austrian Archduke Franz Ferdinand was assassinated by a Serb high school student, the war in Eastern Europe was triggered. Germany was as shocked by the war as anyone, and had no desire to invade France, but was forced to by a treaty with Austria. Today, a new world war could be launched in the same way as either WW I or II. There are Hitler-like figures on the scene, including China's Xi Jinping and North Korea's Kim Jong-un. And there are also deep xenophobic and nationalistic urges that are prevalent in many countries, especially in China and North Korea, directed against the US, Japan, South Korea, Vietnam and India. Furthermore, there's a historical irony. After World War II, the United States took on the role of Policeman of the World, and in doing so, signed some sort of mutual defense treaty with many countries: Japan, South Korea, Israel, Taiwan, the Philippines, the Marshall Islands, the ANZUS agreement with Australia and New Zealand, a special treaty with Iceland, and the NATO agreement with all of Europe. The purpose of these treaties was to discourage attacks on any of these allies that would otherwise have the risk of spiraling into World War III. The most obvious imminent threat is North Korea. Two days ago, China and Russia both signed off on new extreme Security Council sanctions that N Korea calls a "total blockade" and "an act of war." It's becoming increasingly likely that a war with North Korea will begin soon, quite possibly starting with a preemptive strike by the US, and that China will tolerate it as long as US troops and S. Korean troops don't remain in N. Korea, or come close to the Yalu river.